PepMute™ Plus siRNA & DNA Transfection Reagent is an upgraded version of PepMute™ reagent (Cat # SL100566) by crosslinking pre-screened hydrophobic amino acids to its backbone. 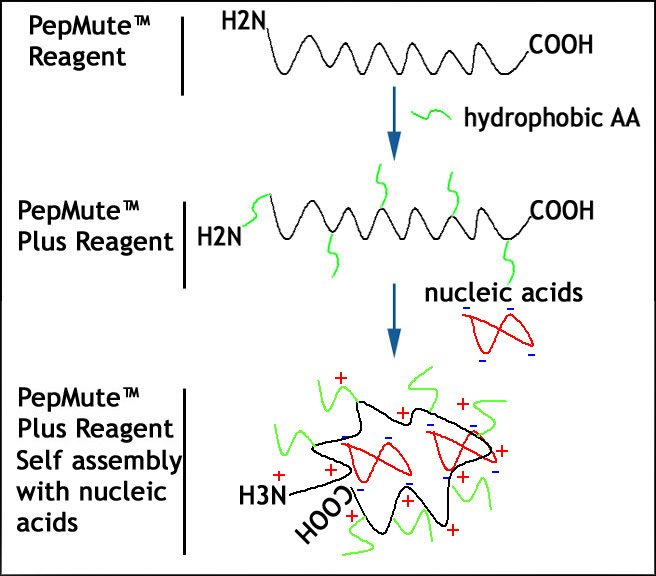 With our proprietary pH Dependent Conformational Change (PDCC) technology, the transfection reagent which contains 36 amino acids long's peptide backbone was formulated by addition of pre-screened hydrophobic amino acids to all amine groups, conferring PepMute™ Plus reagent an ability to self-assembly during formation of transfection complex and making PepMute™ reagent a versatile and most powerful gene delivery tool which provides more than 95% silencing efficiency at 1 nM siRNA in variety of mammalian cells. PepMute™ Plus Reagent have been validated to effectively and reproducibly transfect single DNA or siRNA or co-transfect DNA/siRNA to variety of mammalian cells. Store at 4 °C for PepMute™ Plus Reagent and RT for PepMute™ Transfection Buffer (5x ). If stored properly, the product is stable for 12 months or longer. Figure 2. Knockdown efficacy comparison of PepMute™ Plus Transfection Reagent (upper panel) vs. Dharmafect™ 4 siRNA Transfection Reagent (middle panel) and Lipofectamine™ 2000 (lower panel) on HEK293 cells. siRNA targeting renilla luciferase at different final concentrations ranging from 0.5 to 20 nM was co-transfected with renilla luciferase gene (0.5 µg of pRL-CMV DNA per well) by the above three transfection reagents per manufacturers' protocols into HEK293 cells growing on a 24-well plate. Renilla luciferase activity was determined 24h after post co-transfection with renilla luciferase determination system (Promega). The luminescence was measured from 5.0 µl of lysate during 10s integration with a luminometer (Beckman Coulter LD 400). Luciferase activity was expressed as light units integrated over 10s (RLU) and normalized per mg of cell protein by using the BCA assay. The errors bars represent standard deviation derived from triplicate experiments. Luciferase-silencing efficiency was calculated relative to untreated cells. 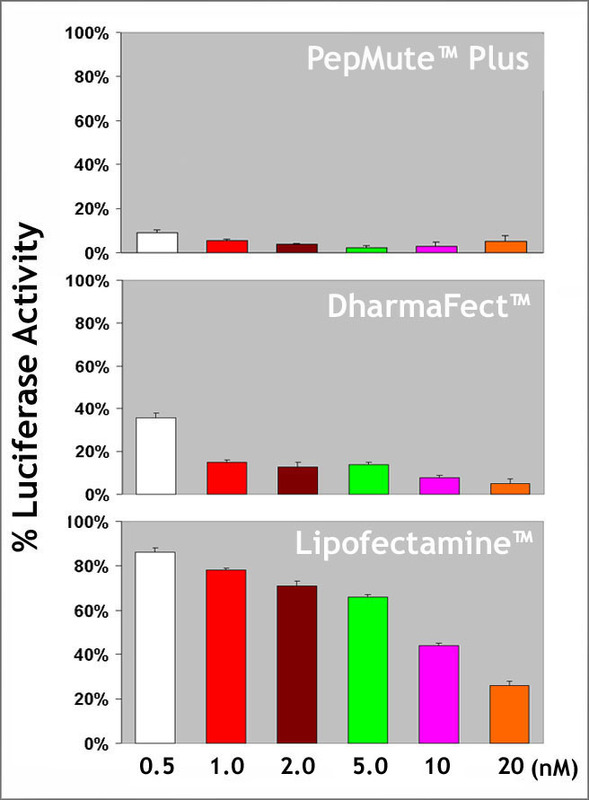 While PepMute™ Plus and Dharmafect™ 4 reagents delivered significant gene silencing from 1.0 nM of renilla luciferase siRNA, lipofectamine™ 2000 gave good knockdown only after 30 nM (data not shown). Figure 3. PepMute™ Plus Transfection Reagent knocked down GFP gene expression in HepG2 cells. GFP cDNA, pEGFP-N3, was co-transfect with a siRNA targeting GFP gene (final 5.0 nM, right panel) and a sham siRNA (final 5.0 nM, left panel) into HepG2 cells by PepMute™ Plus Transfection Reagent. GFP fluorescence was visualized 24h post transfection with a Nikon T2000 fluorescence micorscopy. Quantitative analysis showed that GFP siRNA at 5.0 nM delivered by PepMute™ Plus Transfection Reagent knocked down 96% co-transfected GFP expression in HepG2 cells.